Though the naming scheme of the upcoming Galaxy S10 lineup has been rumored endlessly, we did not yet see it confirmed by Samsung. Now, the French branch of the Korean OEM has gone ahead and done just that. With one week left to Samsung Unpacked 2019, it seems all details, big and small, of the Galaxy S10 lineup have already leaked. Still, leaks are leaks, but confirmation directly coming from Samsung is another thing. Last week, Samsung stuck to identifying the different Galaxy S10 variants with letters. And even yesterday’s monster leak of all S10 specs only made mention of the device’s codenames: Beyond0, Beyond1, and Beyond2. But now, Samsung France has dropped these charades and named the devices outright. 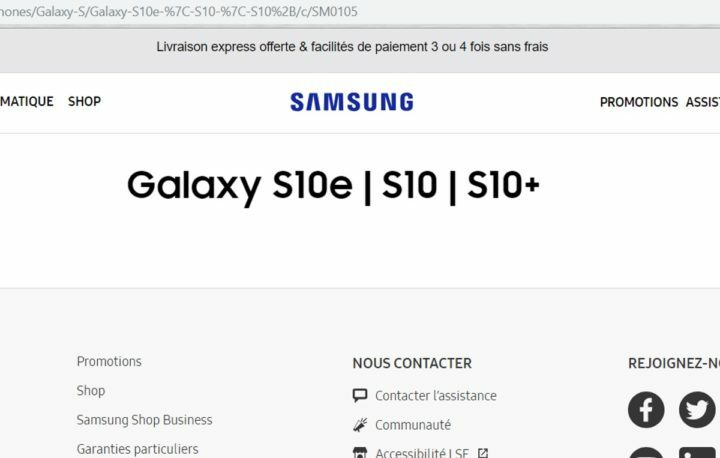 In a page on its own website, likely published by accident, Samsung lists all three S10 models. It is far from the first time Samsung acknowledges the Galaxy S10 branding but never before was the Galaxy S10e name used publicly. Though less surprising, the same goes for the Galaxy S10 Plus. Those of you still hoping for the launch of a 5G version of the Galaxy S10 might observe Samsung France makes no mention of such a device. This should not come as a surprise, because even if Samsung does introduce that variant, it will not make it to Europe any time soon. The complete lack of 5G networks ensures this. However, not even US or Korean 5G models might be launched on February 20, as firmware development for those devices has been progressing very slowly. Samsung might mention them, but we do not expect a full-blown launch until much later in the year. I doubt very much if they publish anything “by accident.” This just keeps the hype going. Each leak is very well planned and timed to keep people talking until Feb 20th.